I have a serious thing for caprese. Really, I love all things caprese like fried mozzarella caprese salad. I even love caprese so much that we had it at our wedding a million years ago. Actually that’s not true. Our wedding was 11 years ago. Not a million. Just feels like a million. You know what with a few career changes and pre and post kid. Pre kid era, though it was only 3ish years ago, seems so long ago. Like maybe the dinosaurs were still roaming the earth back when I wasn’t a mom. But anyway, our wedding back in the Mesozoic era. We got married on one of those perfect June days by the beach. I had on flip flops under my dress and we had photos taken by the ocean. Then we went to a historic old estate and had our reception on the grounds. We didn’t care much about flowers or music. No, we cared about the food. And while I don’t remember what the main course was, I remember two things: the cake and the caprese skewers. 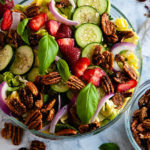 See, though caprese salad pretty much tastes like summer, it is pretty hard to serve as an appetizer for summer social events like weddings and baby or bridal showers because generally you have to sit down to eat it. You know, you need a fork and knife. It’s a big deal. However, at my wedding, skewering the caprese salad and subbing out cherry tomatoes and mini balls of mozzarella for bigger versions made caprese salad portable and perfect for eating while mingling. 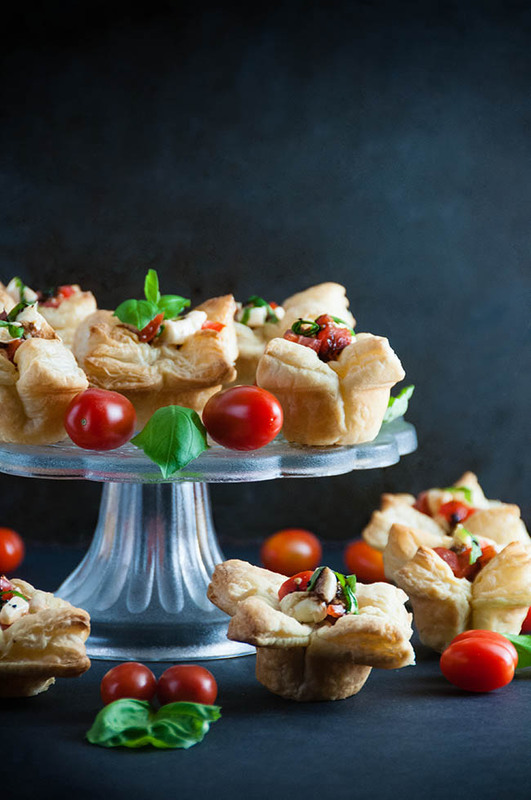 The same is true of these Puff Pastry Caprese Cups. 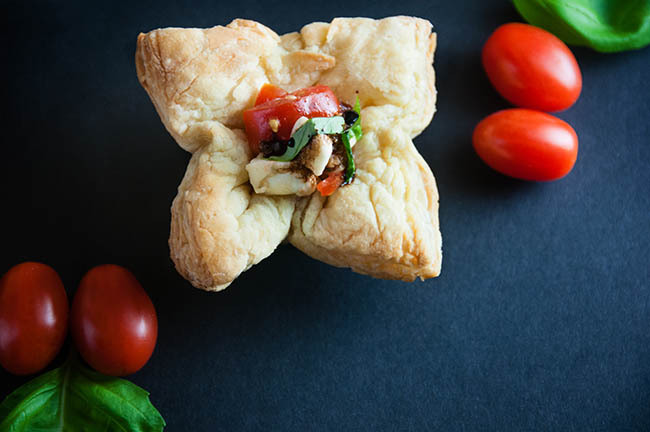 Putting the caprese salad inside flaky Pepperidge Farm® Puff Pastry cups makes it totally portable and perfect for mingling. 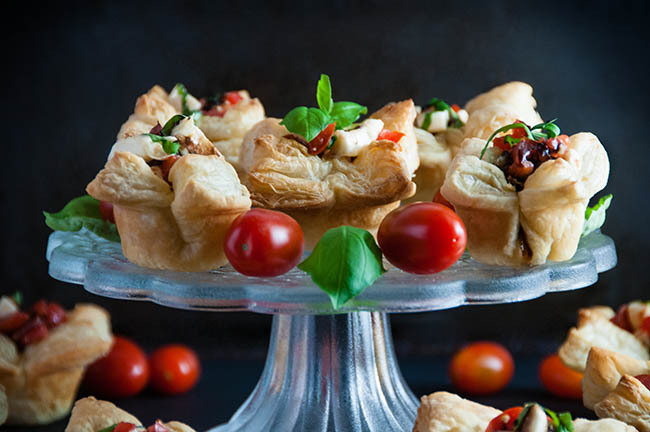 You could definitely serve these at a wedding or shower as an appetizer and then use another package of Pepperidge Farm® Puff Pastry to make adorable little desserts like Puff Pastry Cheesecake Cups. 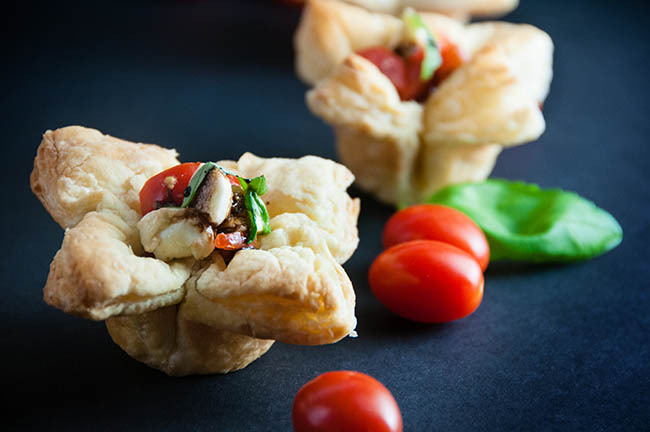 Or check out the Puff Pastry website for tons more information on how to use this versatile product in appetizers or desserts. Plus, let’s talk about how stinking delicious they are. Caprese by itself is amazing. But this? OMG. They might be one of my favorite things I have ever made for this little blog. For real. 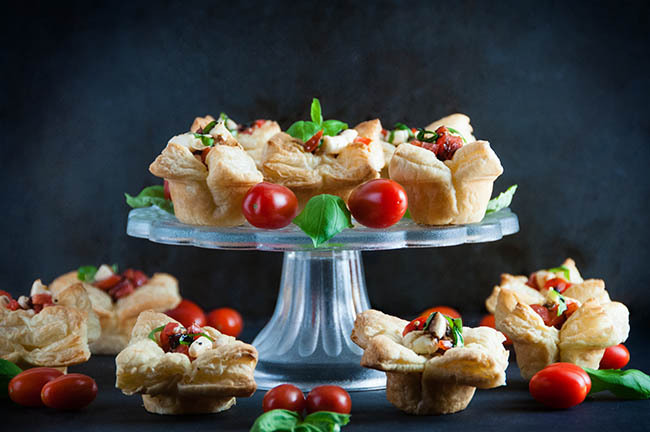 With the traditional caprese flavors of sweet tomatoes and basil and creamy mozzarella complemented by the ultimate deliciousness of Puff Pastry, it’s to die for. Then drizzle on a little balsamic honey reduction and just stop it. Seriously. Stop it. Because I want to eat it all and not share. And best yet? 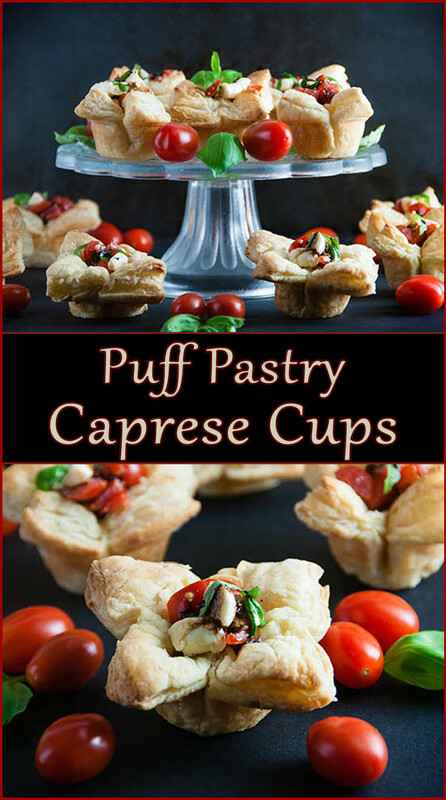 These Puff Pastry Caprese Cups are so easy to make. The dough is easy to work with and shape into these pretty little cups. I made all 18 dough cups in about 10 minutes. Then it bakes up in another 10 to 11 minutes. While it’s in the oven, you can prepare the caprese filling and the reduction. And bam, before you know it, you are enjoying these amazingly perfect bites of caprese deliciousness. 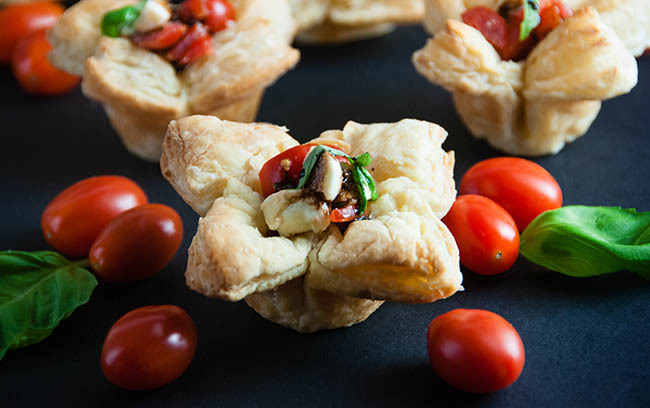 Puff Pastry Caprese Cups make the perfect appetizer for summer soirees. 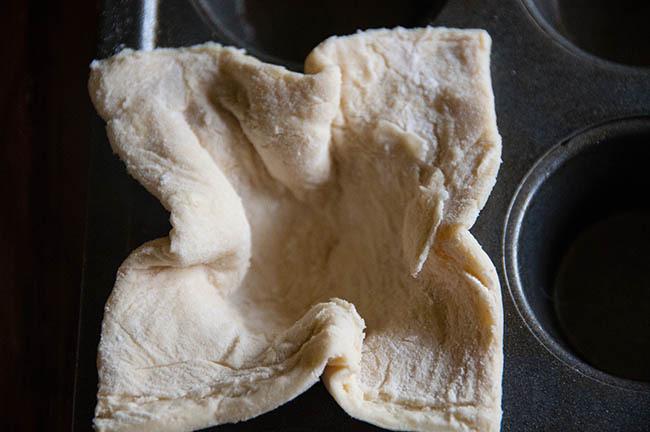 Thaw the Puff Pastry Sheets on the counter until pliable and easy to work with. When the dough is thawed, cut it into strips along the fold lines. Fold each strip into thirds to make squares. Cut along the fold lines to make the squares. You should wind up with 18 squares in the package. To make the cups, gently squeeze the two parallel sides of the square to pinch the opposite sides towards the middle. Repeat on the other side. Place each square into a mini muffin tin. 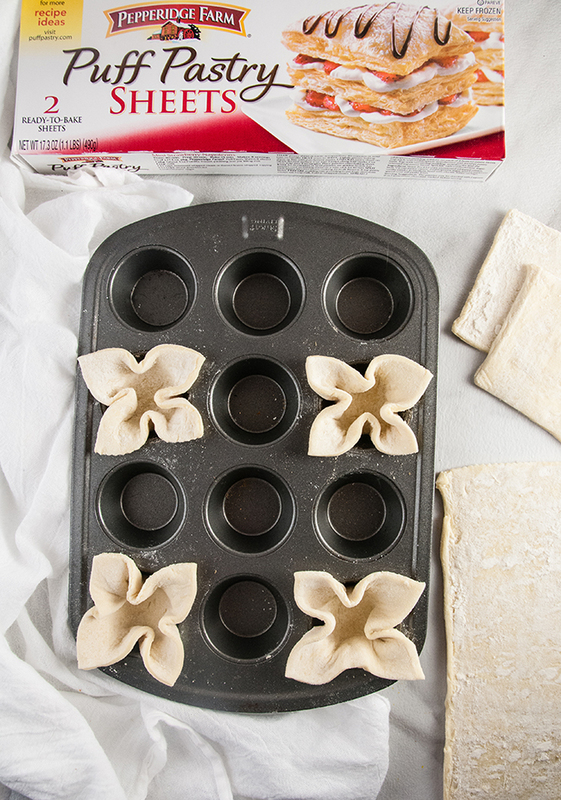 Leave every other space in the muffin tin empty to account for the dough rising. Bake at 400 degrees for 9-11 minutes or until the pastry is golden brown. Remove from oven and let cool. If the middles of the cups have puffed up too much, gently press down with a spoon to make room for the filling. While the dough is baking, chop the tomatoes and mozzarella balls into very small pieces. Combine in a small bowl with the basil ribbons, pressed clove of garlic, olive oil and salt and pepper. Fill each Puff Pastry cup with a spoonful of the salad. Drizzle balsamic reduction to taste on each cup. Whisk together a half cup of balsamic dressing and a tablespoon of honey. Heat over medium low heat, stirring occasionally, until it slowly simmers and reduces by half (about 10 minutes). Serve immediately. Mmm these sound and look so good!! One of my favourite salads too ☺️ Such a cute idea with puff pastry! Pinning! 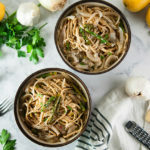 These look so good and delicious! 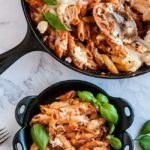 What an easy dish! 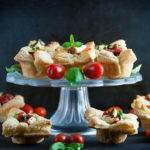 Your Puff Pastry Caprese Cups look amazing!!! I’m an idiot in the kitchen and your recipe makes me think even I can make them. Great job! 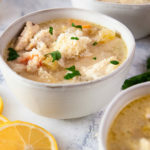 Food photography is on point as well! I love anything puff pastry. Must try your recipe.